Washington | Reuters — The U.S. and Mexico agreed on Monday to overhaul the North American Free Trade Agreement (NAFTA), putting pressure on Canada to agree to new terms on auto trade and dispute settlement rules to remain part of the three-nation pact. Negotiations between the three trade partners have dragged on for more than a year, putting pressure on the Mexican peso and the Canadian dollar, both of which gained against the U.S. dollar after Monday’s announcement. Trump spoke with Trudeau on Monday, his economic adviser Larry Kudlow told reporters. The deal with Mexico should serve as a “reset” for talks with Canada, Kudlow said. The U.S., Mexico and Canada do more than US$1 trillion in trade between them every year. Matt Blunt, president of the American Automotive Policy Council, which represents General Motors, Ford and Fiat Chrysler, said the group was optimistic about the new deal, though it was still reviewing the details. The deal would require 75 per cent of auto content to be made in the NAFTA region, up from the current level of 62.5 per cent, a U.S. trade official said. A fact sheet describing the bilateral agreement specified the content would be made in the U.S. and Mexico. 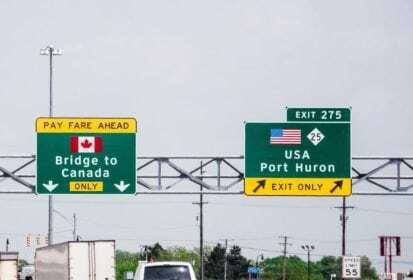 The Trump administration said the deal improves labour provisions, in part by requiring 40 per cent to 45 per cent of auto content to be made by workers earning at least $16 per hour — a salary that could remove incentives for automakers to move jobs to Mexico. Instead, the U.S. and Mexico agreed to a 16-year lifespan for the deal, with a review every six years that can extend the pact for 16 years, U.S. Trade Representative Lighthizer said. Mexico agreed to eliminate dispute settlement panels for certain anti-dumping cases — a move that could complicate talks with Canada, which had insisted on the panels. GM, Ford and Fiat Chrysler gained between 3.3 per cent and 4.8 per cent, while Canadian auto parts makers such as Magna International gained 4.6 per cent. — Reporting for Reuters by Roberta Rampton and Jeff Mason; additional reporting by Sharay Angulo, David Lawder, Dave Graham, Andrea Hopkins and David Shepardson.